Recently, the Science and Engineering Complex (SEC), located on the Medford/Somerville campus at 200 College Avenue, received LEED Gold certification. LEED (Leadership in Energy and Environmental Design) is a voluntary green building rating system that recognizes high-performance, energy efficient and sustainable buildings. On Wednesday afternoon, 11 Eco-Ambassadors went on a tour of the SEC to better understand what makes the building so energy efficient. 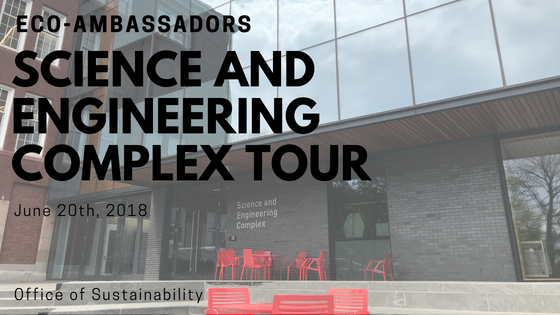 Elliott Miller and Michael Skeldon from Facilities Services along with Bruce Panilaitis, the Director of the Science and Engineering Complex, led the group through the architecturally stunning building to explain the inner workings of this state-of-the-art, one-of-a-kind building. In the initial planning stages, the SEC was set to be built next to the location of the older Robinson and Anderson Halls, with potential plans to demolish Robinson Hall. However, they later decided to preserve both of the older buildings and convert them into wings of the new SEC. Not only is this more sustainable, it also helps preserve the history of the University. 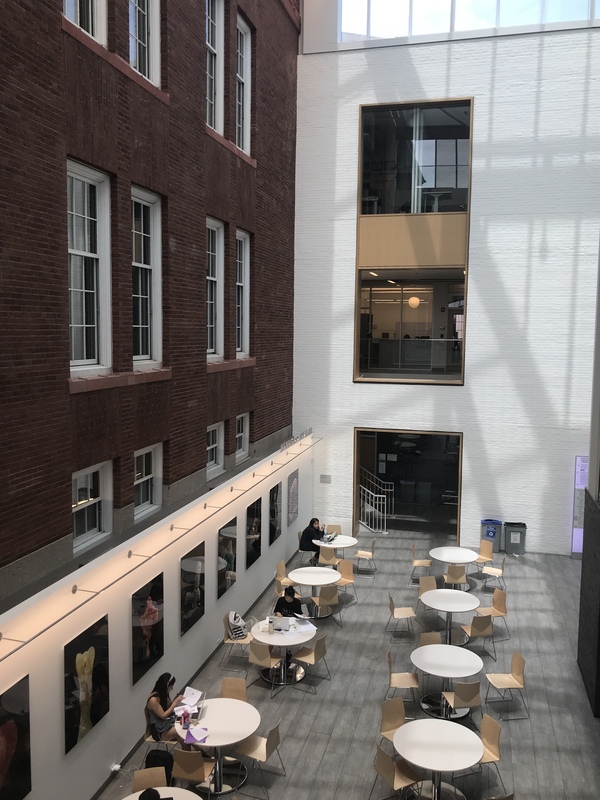 What is left is a stunning juxtaposition of old and new with the exposed brick visible within the modern interior of the atrium of the building. The SEC houses several departments including Biology, Civil and Environmental Engineering, and Mechanical Engineering, as well as the offices and labs of several other departments. The structure of the spaces provides ample opportunities for interdisciplinary collaboration. The SEC is designed for maximum energy efficiency. The building has tight doors and a white reflective roof to reduce the summer cooling load. While having an all-glass exterior may seem inefficient, the triple glazing on all SEC windows reduces heat loss in cooler months and helps keep the building cool in warmer months. The volume of air that goes in and out of the building is tightly controlled. Conditioned air is recirculated from office and classroom areas and blended in with outside air for laboratory use. The building also uses low and medium temperature chilled water to provide year-round cooling. The chilled water has two systems and different supply temperatures (38°F and ~60°F) to optimize the efficiency of the CEP (Central Energy Plant) chillers and to provide efficient condensation free cooling without risking dripping from the chilled beam cooling. 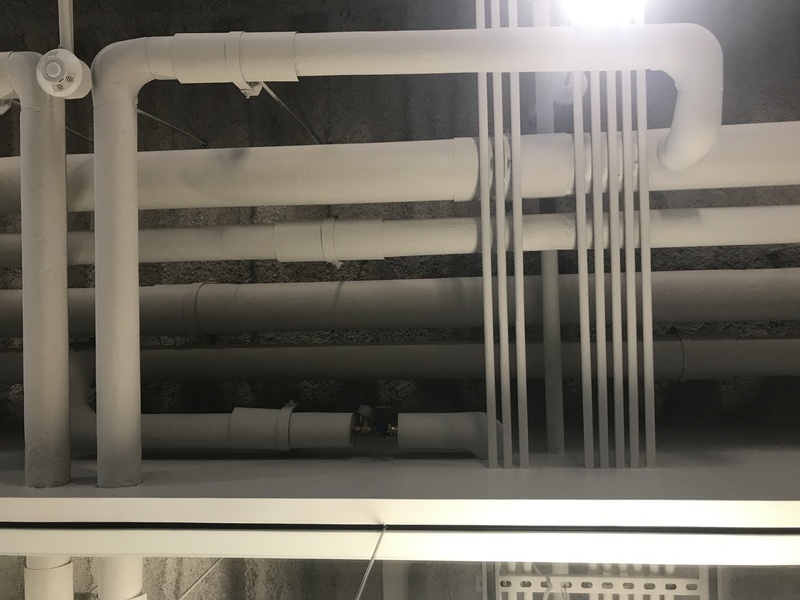 Scheduling and occupancy sensors are built into each lab and office in the SEC and daylight dimming sensors automatically control the light levels in rooms to adjust for varying amounts of sunlight. There are also carbon dioxide air quality sensors in meeting rooms. When there are more people, more air is let into the room to maintain a consistent minimum air quality level and a comfortable temperature. If no one is detected in the room after a preset amount of time, the lighting is turned off and the heating or cooling set-points are significantly relaxed to minimize energy use until someone reoccupies the space. 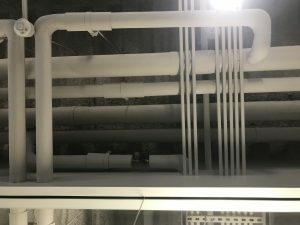 A striking aspect of the building is the exposed ductwork and piping which actually has a very practical purpose — having all of the valves and airflow controls exposed allows technicians to easily see the control position indicators of the equipment and troubleshoot a malfunction, often without even having to get a ladder. This allows for quicker repairs which reduce the amount of time when energy can be wasted as the problem is being solved. The SEC’s new LEED Gold certification is particularly notable because of how difficult it can be to achieve a sustainable design in a laboratory building. These types of buildings tend to be highly energy dependent and unsustainable due to necessary safety precautions and the complex needs of lab occupants. Air changes in lab spaces are particularly important as they make sure that the air stays clean of contaminants and at a moderated temperature. 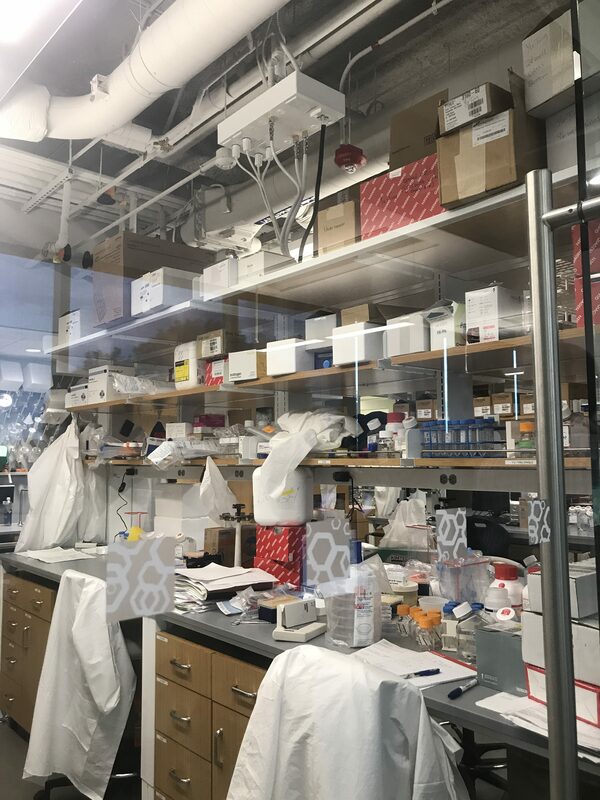 The building’s lab spaces use a minimum amount of air changes to reduce the amount of heating or cooling necessary to maintain the laboratory environment. To help optimize the air change rates, an air quality system monitor made by Aircuity, a company headquartered in Newton MA, measures certain parameters like VOCs, dust, humidity, and CO2, and compares them to the outside air. The system samples the air every 15 minutes and if abnormalities are detected, the frequency of air changes (air from the laboratory gets sucked out and replaced by new air coming in from the outside) is increased until the contaminants in the air are back down to an acceptable level. Normally, a minimum of five air changes occur each hour during the day, and less at night when no one is in the building. Mike explained that this is much less than some other laboratories that are designed to constantly exhaust 10 to 12 air changes in an hour. 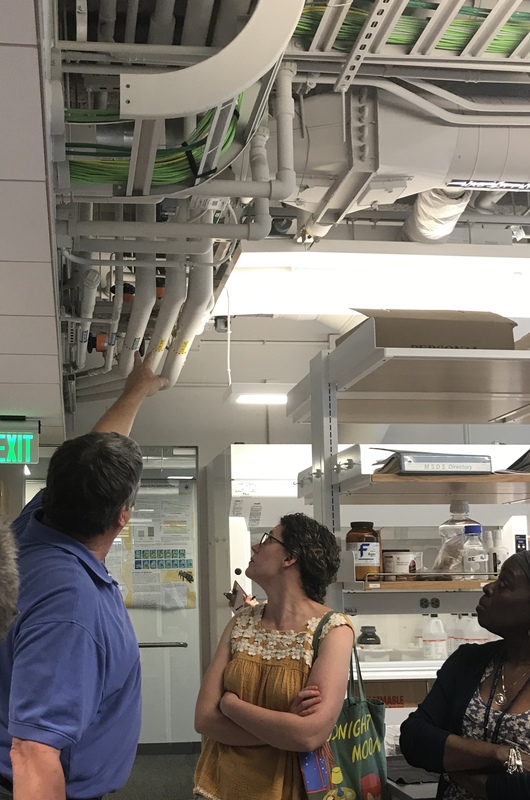 The labs also have high-efficiency low flow fume hoods that are able to sense how much air should be flowing based on whether the fume is open or shut and if there is a person present. When no one is present, less air is drawn through which helps to further conserve energy. The labs also accommodate a wide range of research needs while respecting sustainability. “A key aspect of efficiency is adaptability,” Michael explained. In the SEC, each level has the same basic layout even though the building is used by many different departments. In addition, the individual labs are designed to be easily modified. The furniture is not fixed so that it can be easily moved at any time and infrastructure aspects such as vacuums, chords, chemicals, and gas can be easily installed or removed from fixtures on the ceiling. This allows the needs of the researchers occupying the lab at any given time to be easily met without needing to significantly change the physical space. The SEC is as functional and practical as it is energy-efficient and beautiful! One of the biggest challenges of introducing a new, state-of-the-art building such as the SEC comes after the construction is completed. A building with many sustainable functions cannot live up to its full potential without the understanding and support of its occupants. For example, even though air is tightly controlled to ensure the highest possible energy efficiency, this is rendered useless if the occupants decide to leave the windows open in their office all day. 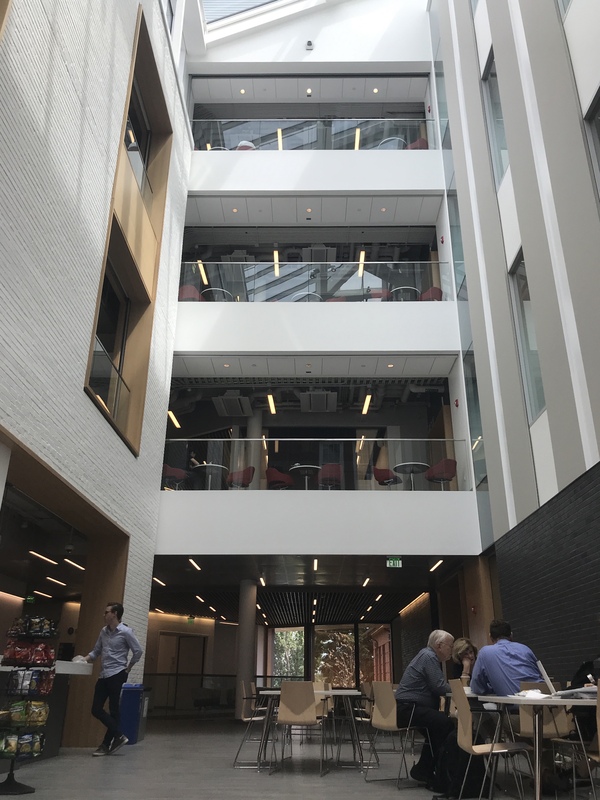 While there will be a slight learning curve to using the building, the SEC is sure to provide a comfortable and exciting learning and innovating space for students, faculty, and other researchers for years to come. Part 3 of Unwrapping Building 574 is Available! Part 3 of Unwrapping Building 574 is now available! Part 3, entitled Adaptation, talks about the difficulties and nuances of adapting such an old, historic building into a modern, sustainable office. The section also includes some pictures of the building and concludes our series. We hope you’ve enjoyed it! Not even the interior and exterior details were ignored on the 574 project. The appliances and plumbing will feature energy and water efficient features, and the exterior will feature colored metal paneling for a contemporary look. 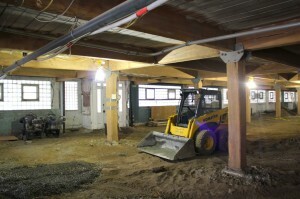 Carpet, concrete, wood, and a large quantity of supply materials will be recycled goods. All of these elements make for a unique designed, energy aware building. The building, which both assuredly believe will be impressive upon completion, is a great entrance marker for the Tufts campus. With its new design and features, its hopes to showcase the sustainable initiative inherent in the university, and play a new role in the campus’ prestigious legacy. Part 2 of “Unwrapping Building 574” is Here! 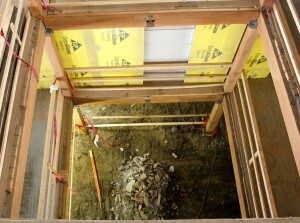 Our ongoing coverage of building 574 continues with Part 2- Stormwater. The interview details some fascinating mechanics of the building design, including how water and runoff is handled. Read it here! I asked Ray Santangelo and David Kadish if stormwater drainage was a factor in the design of building 574. “It was actually required,” Kadish said. “The age of the building resulted in a system that sent the storm water to the sewer lines, which is no longer allowed by the city’s code. This resulted in the installation of filtration tanks to mitigate the amount of water being sent to the city’s infrastructure.” Stormwater infiltration systems are used to collect, treat, and recharge stormwater runoff generated from impervious areas of developments, such as roofs, sidewalks, and parking lots. They improve stormwater runoff quality and quantity and help to recharge underground aquifer water supplies, reduce the total volume and peak rate of runoff discharged from a site, and reduce the amount of water directed to City stormwater collection systems. The conversation also included stormwater recharge systems. Kadish explained these in great detail. 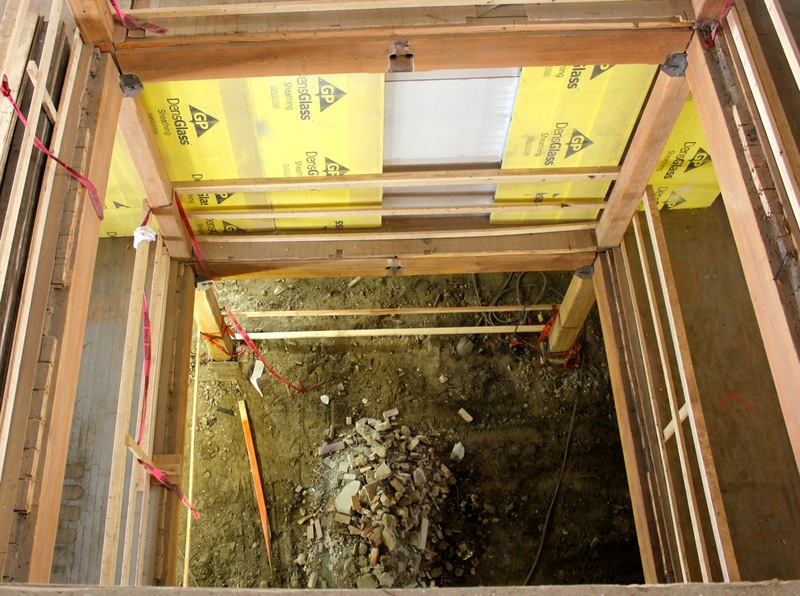 “For the 574 Boston Avenue project, there are a few different types of stormwater recharge systems, including pervious pavers, a drywell, and two pipe and stone systems. Pervious pavers allow runoff to infiltrate by providing enough space between each individual paver for water to pass into the underlying soils. A drywell is a concrete chamber with small holes in the concrete walls that drain the chamber. Pipe and stone systems are a mix of perforated pipe surrounded by crushed stone.” Crushed stone is a useful material for infiltration systems because of its high void properties. The more void space a soil has, the more stormwater it can ultimately store and infiltrate. All three types of systems use the same process, which is to collect runoff from impervious surfaces, store it within the system, and slowly let the runoff infiltrate into the underlying soil. This also has ramifications for the building’s LEED rating system, the environmental rating that assesses the green design of a project. Stormwater Quantity ratings require that a site infiltrate at least 25% of the runoff generated by a site. Using the techniques described above, the 574 Boston Avenue project will reduce the runoff sent to the City stormwater systems by almost 60%, a true representation of the design team’s dedication to sustainability.